One of the most crucial areas of today’s game actually happens off the court. It seems that more than ever, tennis matches these days are influenced by a player’s dedication in the gym, at the track and inside the kitchen. Whether it means focusing more on workouts or dieting, a player who takes care of his or her body will generally benefit with increased agility, endurance and overall health. For tour pros and high performance players all over, this aspect of the game has never been more highly studied, planned and stressed. One athlete that has shown this type of devotion to his health and fitness is ATP Pro Frank Dancevic. Frank Dancevic has a strong focus on health and wellness in his game. 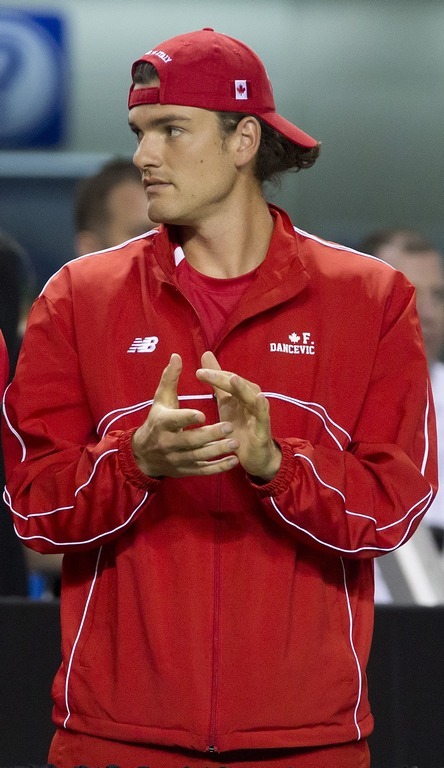 Dancevic is a Canadian-born player who turned pro in 2003. His ranking reached as high as 65 in 2007. In 2011, he was the first player ever to advance through qualifying rounds of all four grand slams in a calendar year. He played this past season for the Philadelphia Freedoms. In a recent interview before a WorldTeamTennis match, Dancevic spoke about his preparation for the season and how he tries to stay a step above his competition. According to Dancevic, players who take time out of their day to pay attention to the details can see a number of benefits that could lead to a jump in the rankings or that big win in a key match. Dancevic said prior to each leg of the season, he breaks down his schedule and analyzes what kind of stress he will be putting on his body. He explained that many of the exercises he does involves injury prevention. Dancevic also spoke about another key aspect to keeping in shape: stretching. He said he does a lot of stretching before and after matches, and he likes to loosen up his back and have a light hit session an hour before every match. Before a match, he also focuses on carb intake and hydration, refueling electrolytes so that his energy is always at performance level. “I stretch two or three times preparing my body for dives and lunges,” Dancevic said. Another pro player that takes her preparation seriously is seven-time grand slam champion Liezel Huber. During a clinic at Frog Hollow Tennis and Racquet Club in Lansdale, Pa. this summer., Huber spoke about her training to a group of kids and parents. Huber takes pride in the way she trains, but has a different approach to her preparation. Huber’s strategy includes breaking her tennis life into thirds. This “pie chart” method involves one slice being tennis, the next slice being mental, and the third nutrition. She spends her time after each match going through all three areas. The tennis piece includes her training regimen and what areas to improve on from a previous match. Huber leaves the mental side to focusing on getting into the right mindset before and during the match, envisioning points in her head. Nutrition is supplements she puts in her body on a daily basis. Each player has a different style and a different way of getting fit and on the court. What is it that gets you ready to play?